Cotton Spinning Made Easy also takes time to explain how your wheel works and what adjustments you need to make to the wheel so it makes cotton spinning easy. 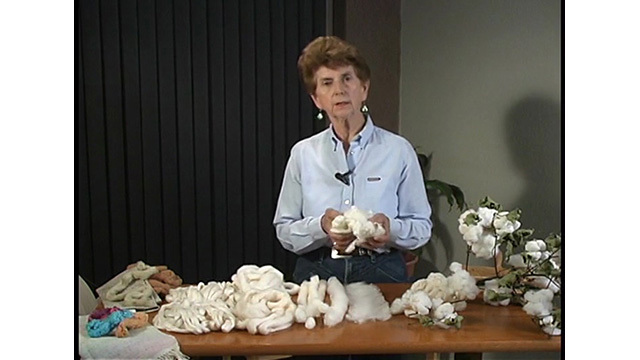 Joan also includes a segment on the different types of cotton, how each are prepared, and how to spin it into the soft, beautiful yarn you have dreamed about. I have been spinning wool over 20 years. I used to have a sheep dairy farm with Icelandic sheep who gave me in the neighborhood of 250 fleeces in a year. Needless to say, a lot went to the mill, but I did a lot of production spinning and am darn good at it. I have been to many classes and watched many videos. This video is perhaps the best spinning video I've ever seen. Joan Ruane is perfection and delightful. Even when she's explaining something you think you know already, you feel more confident in your knowledge. She is comprehensive, and she explains everything efficiently in a way you can SEE and UNDERSTAND. In addition, you feel you are at the feet of a master. She is fun and inspiring. You never feel that time is being wasted, but you always feel that what is happening is not only fun but deeply satisfying. I simply cannot recommend this video highly enough. It has opened a whole new world for me. I thought I wouldn't like cotton spinning. Why? I think it was because I felt I could always be perfecting my wool spinning--and quite honestly, because I just wasn't open minded. In a class with Judith MacKenzie we tried spinning some cotton punis and the effect on me was electric! I couldn't wait to try more. I order some ginned cotton and cotton cards and went to work making punis--which is so fun I can't believe it--watched this video and then made MUCH BETTER PUNIS and was off spinning. Ruane gives you all you need to know to relax and start enjoying the work right away with the knowledge that no matter what you produce it will be worthwhile and usable, but also with the assurance that you will always be getting better at it. There is something of the great teacher in her. I was mesmerized by the video and watched the whole thing straight through, drawn in and fascinated. There's something in her approach and delivery that is simply delightful. She clearly loves what she does and loves teaching it. But she doesn't waste a second of your time, and yet everything is delivered at a pace that seems perfect. You should know a bit about spinning and plying--but you don't have to know much. She covers the basics, reminding you of what is important. You really want to buy this video and enjoy it and perhaps find a whole new world of spinning.